For some pumpkin pie lovers, the most important part of the pie is the creamy, pumpkin filling. 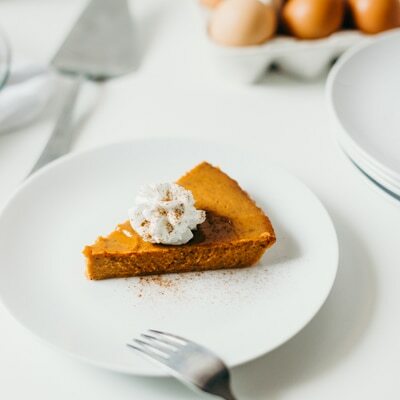 Try this crustless version of Libby's Famous Pumpkin Pie, without the crust, and enjoy more of what you love about this pumpkin holiday tradition. See LIBBY’S® Famous Pumpkin Pie recipe for filling ingredients and mixing directions. Then, see below for baking directions. PREHEAT oven as directed below. Glass baking dishes without crust require a cooler oven, and in most cases, a longer baking time. SPRAY with nonstick cooking spray or lightly grease bottom of baking pan or glass baking dish. PREPARE filling as directed on 15-oz. or 29-oz. can of LIBBY’S® 100% Pure Pumpkin. Pour into pan or dish. BAKE as directed below or until knife inserted near center comes out clean. COOL on wire rack for 2 hours. Serve immediately or refrigerate.